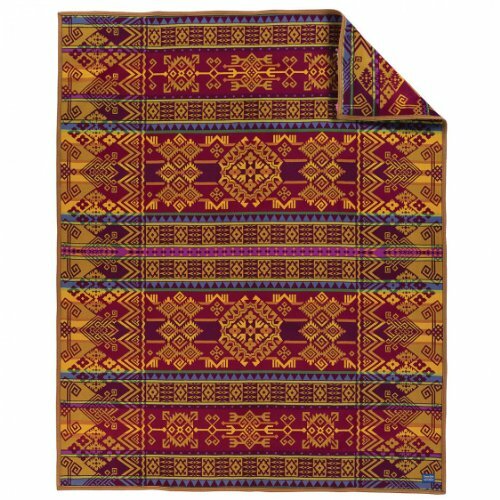 The rich tones of the Pendleton Abiquiu Sunset Wool Blanket reflects the colorful, natural red rock cliffs of Northern New Mexico at sunset—gold, brown, purple and maroon. Made of 82% pure virgin wool and 18% cotton, it is fully reversible and the robe size preferred by Native Americans for ceremonies and wrapping themselves for warmth. Woven at Pendleton's Northwest Mills. Unnapped and felt bound. Style # ZD543-52771. Made in USA. Comes in a signature Pendleton blanket box. No sales tax. Beaver State.Twin size: 64 x 80 inches.